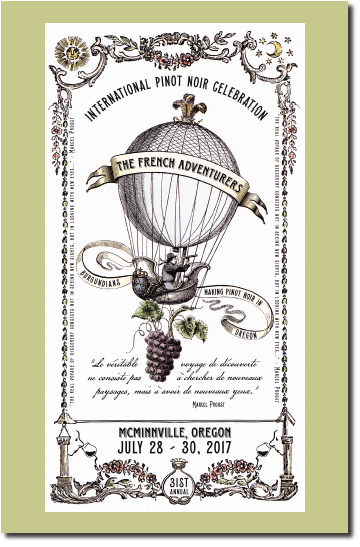 The 31st annual International Pinot Noir Celebration (IPNC) will be held July 28-30 in McMinnville Oregon. The theme will be “The French Adventurers: Burgundians Making Pinot Noir in Oregon.” Eric Asimov of The New York Times will moderate the Grand Seminar which will include the following panelists: Dominque Lafon (Lingua Franca), Véronique Boss-Drouhin (Domaine Drouhin Oregon), Jacques Lardiére (Résonance), Jean-Nicolas Méo (Domaine Nicolas-Jay) and Alexandrine Roy (Phelps Creek Vineyards). IPNC is an annual rite of pilgrimage for lovers of Pinot Noir who revel in three days of exquisite meals, seminars, tastings and celebrating with fellow Pinot geeks. Early Bird Pricing ($100 off weekend tickets) ends December 31, 2016. Visit www.ipnc.org to confirm your place at the Celebration and see the featured wineries from North America, Europe and the Southern Hemisphere. Lodging arrangements should be made well in advance as space fills up quickly. See you there!